Every bride dreams about what she will wear on her wedding day. Wedding dresses are the things little girls’ dreams are made of! From the dress to the shoes, and from the hair to the style of makeup, a bride wants to look her absolute best on her big day and will likely put a ton of time and effort into picking out every detail. But what about her male counterpart? It’s not quite as likely that the groom has put as much thought as the bride into what he will wear when he says “I do.” So in order to help the men of the world feel as special in their wedding getup as their brides, we’ve put together a list of some unique and creative accessories to take a groom's attire to the next level and better express his personality in the process. Whether your groom is planning to wear a dressy tuxedo or a more casual suit, his look can be taken up a notch with the help of some unique accessories. Check out the next slides for some creative attire additions and options for grooms. 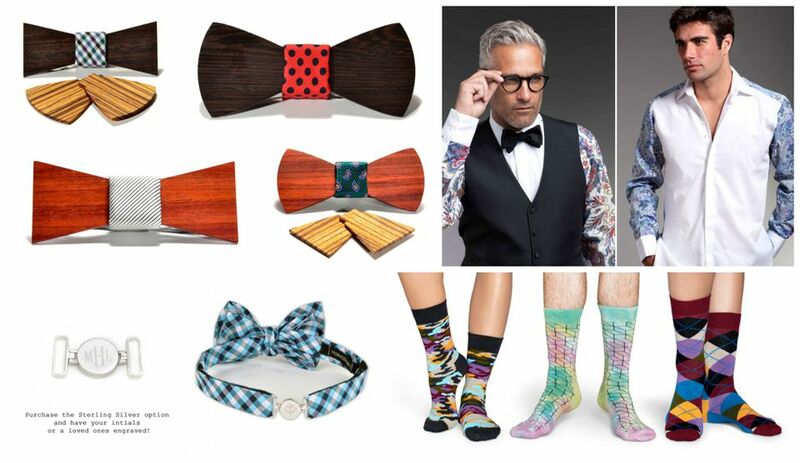 Switchwood is an innovative and creative men's fashion company that created an amazing interchangeable wooden bow tie. They offer pre-designed box sets featuring their favorite combos of fabric, shape and wood type. The unique style and the multi-way factor make the Switchwood bow tie quite a statement piece. Have the groom wear one or get the groomsmen in on the wooden bow tie, too. They'll be able to reuse and swap their "tails" to create a new look the next time. Another unique neckwear item for grooms and groomsmen alike is the Better Bow Tie from Horace Hugh. This innovative product puts a spin on the traditional bow tie by allowing a groom the ability to tie his bow around another surface besides his neck, creating a perfect bow every time. The magnetic enclosure on the back of the bow tie gives the user the opportunity to mix and match "tails" for different occasions, and a convenient way to take his bow tie on and off. The bonus of the magnetic enclosure is that you can also engrave it with a monogram or a personal message for an even more meaningful fashion accessory. These unique patterned sleeve dress shirts make quite a fun look for a groom to sport under his suit and tie. With a jacket on, the shirt looks crisp and unassuming, but upon peeling off the outer layer the groom will reveal a big surprise. These shirts are definitely a fun choice for the groom who wants to let loose at the reception and make a bold statement. How is your groom's sock game? Choosing a pair of socks that give a nod to your groom's interests, favorite colors or personality will add an extra personal detail. Choose a fun pattern or a pair that has your wedding colors, or perhaps socks that feature his favorite cartoon character. This little detail may go unnoticed by most of your guests but it can help your groom's interests and influence feel more represented in the grand scheme of your day.